Crazy about WhatsApp? Often go abroad and travel? WhatSim is perfect for you. If you often travel a lot and face international roaming charges on data and can’t use WhatsApp all the time you travel to keep in touch with your friends, we have got a good news for you. WhatSim has arrived which is an invention of Manuel Zanella , who is also the founder and CEO of Zeromobile. 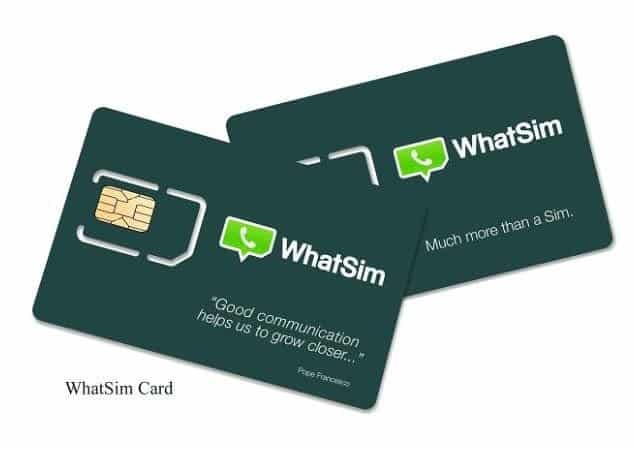 This SIM sets you access WhatsApp and message for free on the move, no matter where you are or whether if you have an active data plan or not. So, how does it work? The working is pretty simple, because WhatSim is compatible with 400 carriers around the globe in 150 countries, so you don’t need to worry about switching carriers or changing plans. WhatSim will connect to a provide network and if you travel to some other place where that network is not available, it will look for other networks and connect. Somewhere, if WhatSIm is connected to a network and find a better signal strength on any other network, it will automatically connect without even letting the user know and you will be able to experience the WhatsApp messaging as you use to do via the app. And according to their website, they state that Wi-Fi is not free and you can’t always wait to get free Wi-Fi, but WhatSim solves this problem. The WhatSim costs €10 which is approximately equal to Rs 714. At this price, you can chat for free all over the world for a year, without paying anything else, and this SIM never expires. However, for sharing photos, videos and audio clips, users will have to recharge with credits which varies from country to country. In India, which is in zone 3 users will need 150 credits for photo, 600 credits for sharing video messages, 30 credits for voice messages. Contact and location shares don’t require credits. Each recharge of €5 gets users 1000 credits and maximum credit can go upto €50 (10,000 credits). WhatSim inventor Zanella also plans to launch a special version of WhatSim inspired by Pope Francis and it will be designed for those countries of the world that the UN calls the Global South. In those countries, he wants to sell the SIm half of its original price. Notable, WhatsApp rolled out its web client last night which let you scan the QR code on Google Chrome on your desktop and log in. Then you can chat right from your computer with your WhatsApp friends.